The word “snack” can make many of us parents nervous, because we feel like we’ll reach for the “wrong” thing to give our kids. First of all, we all need to relax. A small bag of chips has never hurt anyone. But also luckily for us and our kids, there are so many amazing kinds of beef and pork and chicken and turkey jerkys available today, that this protein filled snack is a pretty omnipresent option for staving off those hunger pangs. Many of today’s jerky makers are people who just plain love jerky and sought to create their own brands made in smaller batches from quality ingredients with no additives. Keep an eye on the sodium count as you make your selections – those can get up there. Otherwise, there’s much to love about jerkys, which on the whole pack a serious amount of protein, are often gluten-free (if that’s a concern), have creative flavorings (look for those with all natural ingredients), and best of all, they taste great, and provide a lot of chew and satisfaction. These days jerkys are my kids’ favorite on-the-run snack. Here are some of the jerkys my family has been loving these past months. And if you really are into the jerky thing, or know someone who is, think about a Jerky of the Month order - never worry where your next beef jerky is coming from! Jerky Snob has one, focused on small hand-crafted jerkys. These new beef sticks come from Mighty Organic, the producer of delicious, high-quality, organic and the only 100% grassfed beef snacks on the market from the same cooperative farmer-owners who produce for Organic Valley. The sticks have 6-8 grams of protein each and are made from 100 percent grass-fed beef. Mighty Organic Sticks have 40 percent fewer ingredients than the leading competitors, and they come in three flavors - Original, Teriyaki and Spicy Jalapeño. Sweetwood has a small fleet of products for jerky fans. Their regular beef jerky, which comes in pouches with flavors like Original, Peppered, Teriyaki, and Sweet & Hot. Then there are the Fatty Sticks, which come in both short and long sizes; they're sticks of smoked meat, in flavors like Honey BBQ, BBQ Hickory, Jalapeno, and Blueberry Maple for those looking for something quite different. Or maybe you’d prefer the Bully Bars, which are small slabs of smoked beef. All of the beef in these products are from grass-fed cows. Everything is gluten-free, and they have no nitrates. Even though it’s all about the taste, it’s notable when women play in a traditionally male world, which certainly can be said of beef jerky. The Two Chicks have a very small line of beer jerkys, one Original, one Habanero (and it’s pretty hot! ), but they were both devoured by the testers. 100% Grass fed Beef, sustainably raised, and free of hormones, nitrates, gluten, and antibiotics. These rugged little pieces are hand crafted in small batches. Available in 8 flavors, these were a massive hit with my boys. The flavors include Uncured Pepperoni, BBQ Beef, Spicy Italian Pork, and 5 others. The minis are sized for kids, high in protein, low in sugar and made without any added sodium nitrates or artificial preservatives or hormones, and these comes in a variety of flavors as well. The minis are available in bags of 6, perfect for toting around in a bag. Each mini has 3 grams of protein and 40 calories. Absolutely one of the most interesting jerkys around! This chef-crafted jerky comes in a number of varieties, each the brainchild of a notable chef. Gail Gand from Chicago, Illinois offers up Sriracha Honey Turkey Jerky, Matt Troost, also from Chicago, gives his beef jerky the flavors of sweet chipotle and raspberries, and Laurent Gras from New York City pays tribute to his favorite holiday, Thanksgiving, with a combination of turkey, cranberry and herbs — and you really get a taste of those flavors. There is also a classic version if you’re feeling more old school about the whole thing. Non GMO, using clean ingredients, grass-fed beef, free range turkey, and gluten free. They comes in individual packets containing between 90 and 100 calories. This company makes steak jerky, chicken jerky, turkey jerky AND bacon jerky. We loved the Teriyaki Turkey and the Honey Barbecue Chicken jerkys. For the bacon jerky, the Old Fashioned Maple Bacon flavor was the favorite. All are gluten-free, with no nitrites. The boys especially loved the Steakhouse Beef Jerky, and the Mesquite BBQ Chicken Jerky, which had a pronounced barbecue flavor. 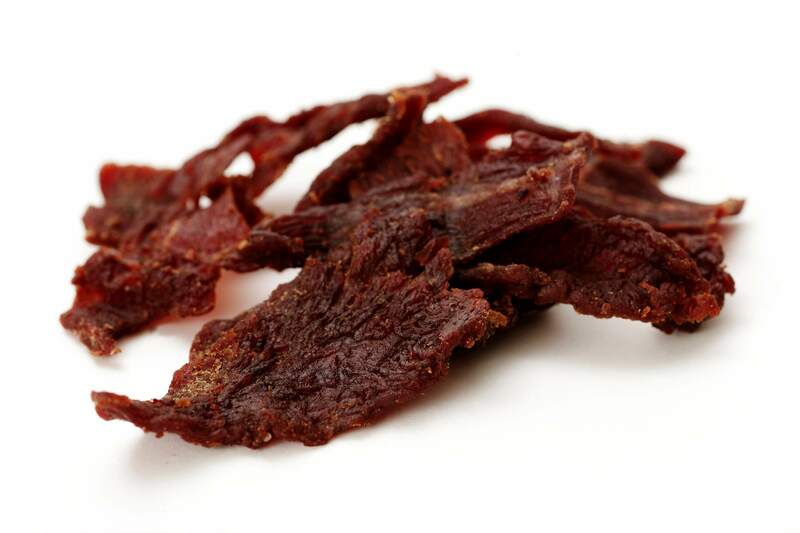 The jerky is made from 100% natural meat and is preservative free. This was a collection of unusual blends of pieces of jerky with other ingredients, such as nuts, berries and seeds. A significant workout for your mouth, older members of the family liked it the most. Beef and turkey varieties available. Gluten free, all natural meat, and less sodium than many other brands. This brand boasted a nice array of choices, many of which met with high approval from kids and adults alike. Spicy Bar-B-Q Beef Brisket Strips, Chili ‘N Lime Beef Steak Strips, Hot & Spicy “Shorty” Smoked Sausages (which also come in a milder flavor). All ingredients are all-natural without added nitrates, preservatives, artificial ingredients, colorings, and MSG. You’ll recognize some of the seasonings like Frank’s® Redhot® Cayenne Pepper Sauce and Kikkoman® Soy Sauce. This all-natural turkey and beef jerky company makes jerky that has no nitrates/nitrites, preservatives, artificial ingredients, added msg, corn syrup, and other additives often found in big commercial jerky products. We loved the Turkey Jerky Cracked Pepper No. 7 and the Honey Spice Beef Jerky No. 11, which was very mild, with good level of honey sweetness, lightly spicy and great texture. All are gluten-free. All natural, no artificial ingredients or processing, and this jerky brand takes its flavor inspirations from Asian cuisines. Lots of pork flavors to choose from like Sriracha or Korean BBQ. Gluten free. This producer makes a very wide array of jerky choices, from the usual beef and pork to more exotic varieties like alligator and rabbit, for the more adventurous eaters. Favorite flavors included Sweet and Spicy Turkey Jerky (“tastes just like the title suggests”), Teriyaki Turkey Jerky, Whiskey Rabbit Jerky and Hot Beef Jerky, which was quite spicy, but quite loved, especially by my older teenager. Made with no preservatives, artificial flavors or colors, nitrates, though some do have liquid smoke. The big winners were the Black Pepper Beef Jerky, BBQ Mesquite Beef Jerky, and Orange Teriyaki Beef Jerky. The meat is 100% grass fed and grass finished, gluten free, and the jerky is low in sodium and sugar. They do use liquid smoke. This brand had a lot of appealing and more unusual flavors: Sweet Chipotle Beef Jerky, Black Cherry Barbecue Pork Jerky, Basil Citrus Turkey Jerky. Hand sliced meat, and short ingredient lists that you can easily absorb make this jerky all the more attractive. These were a big hit with everyone. A house favorite. Sweet Chili Pork Jerky was the most-loved flavor, but everyone also really liked the two (grass fed) beef versions: Szechuan Peppercorn and Korean Barbecue. All natural, gluten-free, no MSG, the pork and the chicken have no added growth hormones, and the beef is also grass fed. Another crowd-pleaser. Chili Lime Beef Jerky, Teriykai Beef Jerky, Spicy Buffalo Style Chicken Strips, and Sweet BBQ Style Chicken Strips were all top picks. All natural, no MSG, no preservatives or artificial ingredients. Most flavors are gluten free, but check the packaging. A few of these beef jerkys were very spicy (especially the Ghost Pepper Buffalo, which elicited some happy tears and frantic hand motions), and they were all heavily coated with the seasonings, which the kids liked. All natural, but with smoke flavoring added. Sweet Sriracha BBQ, Mojo Jalapeno, and Sriracha Teriyakai were all given a solid thumbs up. The bacon jerkys (Sriracha Bacon, Maple Bacon) were a (decadent) change of jerky pace. This brand had some avid fans. You could definitely taste the real maple syrup in the Vermont Maple Glaze & Garlic Powder Beef Jerky, and the Red Rub version was nicely chewy, with a good barbecue rub. A nice balance of seasonings. The beef is from grass-fed cows, with no artificial additives, and you can pronounce everything on the ingredients lists.